The Duro DI2025 Power Grip is a radial constructed tyre. This results in a tough but flexible casing which helps to reduce the hard-impact when riding on rough trails with pits or gravel and increases riding comfort. The special sidewall design helps protect the shoulder area from rock and stone damage and also increases protection to the rim. 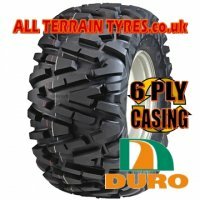 The 6 ply casing produces a strong puncture resistant tyre to boost it's working life and reduce operating costs.